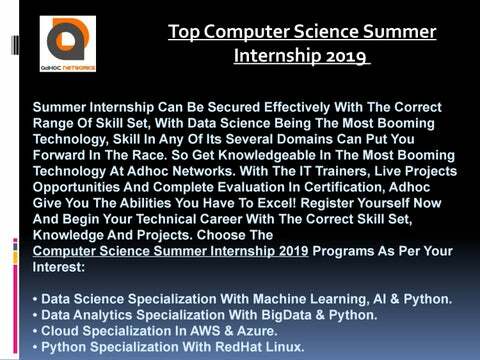 Top Computer Science Summer Internship 2019 Summer Internship Can Be Secured Effectively With The Correct Range Of Skill Set, With Data Science Being The Most Booming Technology, Skill In Any Of Its Several Domains Can Put You Forward In The Race. 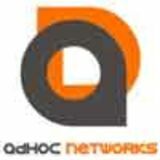 So Get Knowledgeable In The Most Booming Technology At Adhoc Networks. With The IT Trainers, Live Projects Opportunities And Complete Evaluation In Certification, Adhoc Give You The Abilities You Have To Excel! Register Yourself Now And Begin Your Technical Career With The Correct Skill Set, Knowledge And Projects. Choose The Computer Science Summer Internship 2019 Programs As Per Your Interest: • Data Science Specialization With Machine Learning, AI & Python. • Data Analytics Specialization With BigData & Python. • Cloud Specialization In AWS & Azure. • Python Specialization With RedHat Linux. To book your seats please call our the team at +91-8800882664, +0141-4038125.